"MDCR" redirects here. For the airport with that ICAO code, see Cabo Rojo Airport. 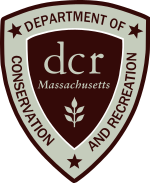 The Department of Conservation and Recreation (DCR) is a state agency of the Commonwealth of Massachusetts, situated in the Executive Office of Energy and Environmental Affairs. It is best known for its parks and parkways. As of December 9, 2015[update], the Commissioner of the DCR is Leo Roy. The DCR's mission is "To protect, promote and enhance our common wealth of natural, cultural and recreational resources for the well-being of all." The agency is the largest landowner in Massachusetts. The Department of Conservation and Recreation was formed in 2003 under Governor Mitt Romney, when the former the Metropolitan District Commission (MDC) and the Department of Environmental Management (DEM) were merged to form the DCR. Ownership and management for many nonpedestrian bridges was transferred to the Massachusetts Department of Transportation in 2009. Jack Murray: June 2013 - 2015. Murray served as deputy DCR commissioner since 2007, managing operations of the state park system. Ed Lambert: February 2011. Lambert was mayor of Fall River from 1996 to 2007, a state representative, and had been director of The Urban Initiative at the University of Massachusetts at Dartmouth. Rick Sullivan: May 2007 Sullivan was mayor of Westfield before becoming DCR Commissioner and left DCR to become the Secretary of Energy and Environmental Affairs. The Division of State Parks is responsible for the maintenance and management of over 310,000 acres (1,250 km2) of state-owned forests and parks. These areas are designated as either Woodlands, Parklands, or Reserves, and are managed to maintain specific land-use characteristics. From the agency's beginning in 2003 until 2012, DCR land management was organized into three divisions: State Parks and Recreation, Urban Parks and Recreation, and Water Supply Protection. In 2012, State Parks and Urban Parks were unified into one division. Within the greater Boston area there are urban wilds, historic sites, and other naturally aesthetic or significant environmental properties. The origins of the collective environments in this part of the division date back to the creation of the Metropolitan Park Commission in 1893, forming the first such regional system in the United States. (see Metropolitan Park System of Greater Boston for history). Lands outside of the greater Boston area includes some 29 campgrounds, over 2,000 miles (3,200 km) of trails, 87 beaches, 37 swimming, wading, and spray pools, 62 playgrounds, 55 ballfields, 145 miles (233 km) of paved bike and rail trails and once private homes and estates that are now a part of the DCR's Historic Curatorship Program. 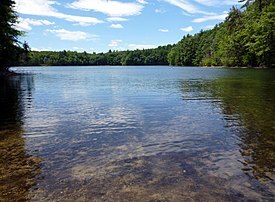 The Division of Water Supply Protection manages 150,000 acres (610 km2) of watershed lands and is responsible for the protection of the drinking water supply for approximately 2.5 million residents of Massachusetts, primarily in Greater Boston. This division monitors lakes and ponds, well drillers, and rainfall throughout the Commonwealth. The Bureau of Engineering provides professional engineering, design, and construction management services in support of DCR properties. In addition to providing engineering services for over 450,000 acres (1,800 km2) of parks, forests, watersheds, beaches, 340 dams, and numerous recreational facilities, the Bureau of Engineering also manages over 525 lane miles of parkways and nearly 300 bridges and tunnels notable for their landmark stature and importance in the Commonwealth’s transportation system. The Bureau is responsible for the management of the majority of the DCR's annual capital budget which has declined in recent years from a $150–200 Million high to a current $70–80 Million. The Bureau of Engineering managed and/or operated a number of bridges across the Commonwealth prior to November 2009. All non-pedestrian bridges were transferred to the Massachusetts Department of Transportation on November 1, 2009 as part of a transportation reform law. Originally, a certain number of bridges listed in the act creating MassDOT were to be transferred after December 31, 2014 when ongoing construction was completed. However, a Memorandum of Agreement between DCR and MassDOT instead transferred these bridges in 2009 along with all other DCR vehicular bridges. DCR is responsible for the stewardship of its lands, from general maintenance—such as emptying trash barrels, cutting grass, and making building improvements—to landscape-level management. DCR also provides services beyond its boundaries, For example, Bureau of Forest Fire Control is available to aid and assist local cities and towns during natural disasters as well as periods of high fire danger, while its Bureau of Forestry administers forest management on both state and private lands. DCR also manages its land through the help of partners. Road repairs are sometimes implemented by the Massachusetts Department of Transportation at the request of DCR. Police protection has been provided by the Massachusetts State Police after the MDC's police department was merged into the State Police in 1992. ^ a b Pazzanese, Christina (September 12, 2009). "A big concern on two major parkways". The Boston Globe. Retrieved 2009-11-05. ^ "Secretary Matthew A. Beaton Announces Department of Conservation and Recreation Leadership Team". Mass.gov. Retrieved 2018-03-06. ^ "Massachusetts DCR Commissioner Carol Sanchez resigns after 7 months on the job". masslive.com. Retrieved 2018-03-06. ^ Staff, Jim Haddadin/Daily News. "Framingham woman resigns top job at DCR to oversee accounting firm". MetroWest Daily News, Framingham, MA. Retrieved 2018-03-06. ^ "Jack Murray Named Mass. DCR Commissioner". wbur. Retrieved 2018-03-06. ^ "Former DCR Commissioner Jack Murray now working for Kinder Morgan". masslive.com. Retrieved 2018-03-06. ^ "Edward Lambert named new commissioner of the state Department of Conservation and Recreation". masslive.com. Retrieved 2018-03-06. ^ "BEAT News". www.thebeatnews.org. Retrieved 2018-03-06. ^ "Deval Patrick names former Westfield Mayor Richard Sullivan to replace Ian Bowles as secretary for energy and the environment". masslive.com. Retrieved 2018-03-06. ^ "Romney Appoints DCR Commissioner" (PDF). ^ "MA DCR has new Commissioner". The NEOW Forum. Retrieved 2018-03-06. ^ "2d official ousted at state parks agency - The Boston Globe". archive.boston.com. Retrieved 2018-03-06. ^ "Inside Our Agency". Commonwealth of Massachusetts. Retrieved 11 November 2013. ^ "Landscape Designations". Massachusetts Department of Conservation and Recreation. Commonwealth of Massachusetts. Retrieved 11 November 2013. ^ 2012 Annual Report (PDF). Department of Conservation and Recreation. 2012. p. 27. Retrieved 11 November 2013. ^ "Division of Urban Parks and Recreation History". Commonwealth of Massachusetts. Archived from the original on 8 December 2009. ^ "Division of Water Supply Protection". Commonwealth of Massachusetts. ^ "Chapter 25 of the Acts of 2009 (Section 177)". The 186th General Court of The Commonwealth of Massachusetts. Retrieved 2009-11-05. ^ "Bureau of Forestry". Commonwealth of Massachusetts. Retrieved 11 November 2013. This page was last edited on 9 March 2018, at 15:33 (UTC).